If you were a member of the Queen fan club, as I was between 1991 and 1998, you received four magazines per year, in addition to your membership card and priority booking on events – of which, at that time, there were not many, because Freddie Mercury had died. The magazines were A5 in size and printed in a very small, nine-point type. 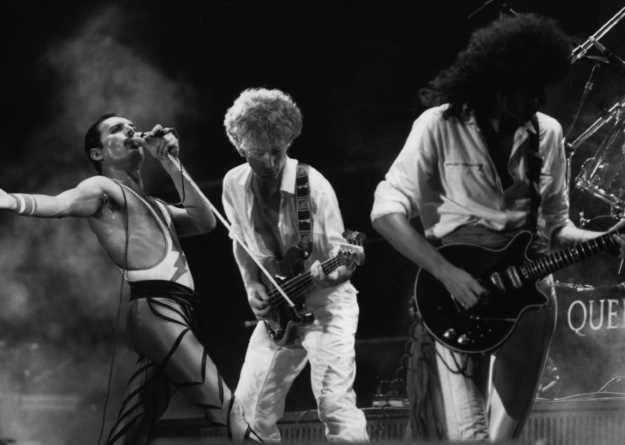 They were edited by a lady called Jacky Gunn, who ran the fanclub, and they featured news of the band members’ various solo projects, photos of fans at conventions, and pictures of Brian, Freddie, Roger and John that may not have seen before. Rummaging through the parental home at Christmas I came across my old magazines and was reminded of the fact that my handwriting is a hybrid of Freddie Mercury’s and Roger Taylor’s, carefully fashioned when I was 12 or 13 at the point at which your signature is just becoming cemented. Freddie and Roger were my favourite members, but their writing also struck me as the most interesting. Freddie did his capital Fs backwards, the crossbars flying out in the wrong direction behind the stem like a scarf in the wind. As his name began with an F, you saw this a lot. Roger favoured a great, round bulb for the R at the start of his name, then dead-straight drops on his gs and ys: you could almost hear the nib ploughing the paper. 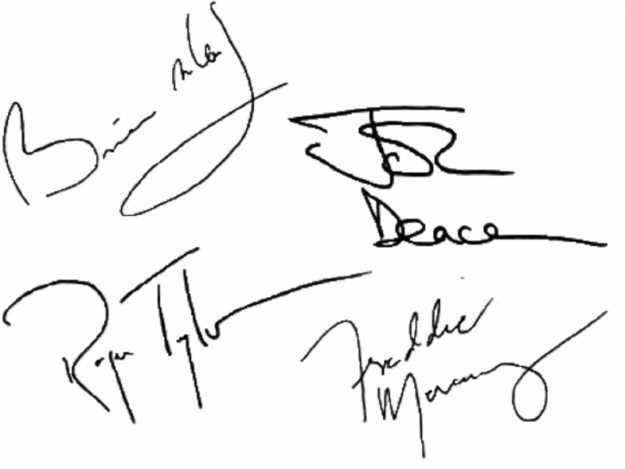 While Freddie’s writing leant all over the place (indicating a writer “subject to the moods and thoughts of the moment” according to Handwriting Analysis: The Complete Basic Book), Taylor’s was almost vertical. “Undemonstrative, independent, detached and even indifferent, this person functions well in emergencies,” says my book. Which rings true for a drummer who handled much of the press and always seemed to be in a relatively good mood. When you interview Taylor now, his answers are so controlled they’re over in ten seconds with time to spare. When I last met him, I ran out of questions after 20 minutes, and asked him about his hobbies to fill the rest of the time. “I like all the usual stuff,” he said – which just foxed me more. Brian May’s handwriting leant as far to the right as it was possible to lean; around 45 degrees. “A volcano of emotional reactions,” says my book. “Passionate, susceptible to hurt... wears self out. An emotional brushfire!” Anyone who’s read the blog Bri’s Soapbox might recognise that description. Brian’s writing also bears a vague resemblence to Richard Nixon’s. Bass player John Deacon has not made a public appearance since 1997. His fanclub letter from March the previous year read: “We’ve had a bad winter with our youngest having a lot of trouble with his ears.” John’s writing sat at a reclined angle. “Emotionally aloof…” says my book. “A well-constructed front made to cover up for inner withdrawal. The writer feels an inward longing to be different…” John: perhaps the most mysterious member of Queen, and not without his own emotional torments. His handwriting left little trace on my memory, and didn’t make it into my teenage script. Queen probably hardly use a pen now, as I don’t. Gradually my own personality, such as it is, came through in my writing as I moved into adulthood, and took over from Freddie and Roger’s. I no longer do my Fs backwards (“a sign of homosexuality,” says my stupid book), and the stems of my Ys aren’t straight like Roger’s, but big and loopy. Big loopy Ys indicate a vivid sexual imagination, it says here. Whatever.